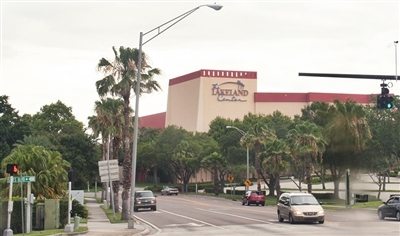 LAKELAND – It will be at the same place and same timeframe, but Annual Conference 2013 at The Lakeland Center next week will be different from years past, with less time spent on department reports and more on hands-on participation by delegates and guests. 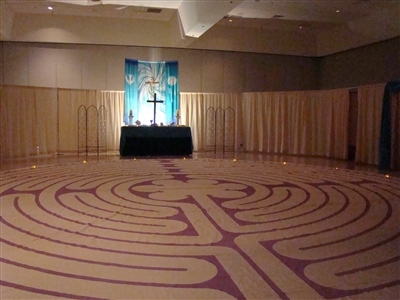 Above, the Prayer Garden, sponsored by the Florida Conference Spiritual Formation Team, will be back for this year's Annual Conference at The Lakeland Center, pictured below. Photos by Susan Green and Dave Walter. Return visitors will find some familiar features, like the Prayer Garden and Cokesbury bookstore. But they also will find new opportunities for mission service in the form of packaging food for people in need; for giving witness by telling others about their personal discipleship journey; and for discernment, by pondering what it means to be one of Christ's disciples through small-group discussions. 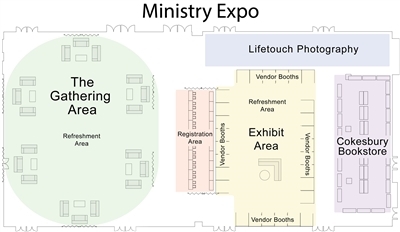 Also new this year will be a change in Ministry Expo. About half The Lakeland Center's exhibit hall will be set aside for The Gathering Area, where people can go to learn about Florida Conference ministries in a relaxing, informal setting instead of lining up in front of booths. New activities are intended to accentuate the 2013 theme "Becoming Disciples of Jesus Christ," and Bishop Ken Carter will preside over Florida's Annual Conference for the first time. The event kicks off at The Lakeland Center, 701 W. Lime St., at 2 p.m. Wednesday, June 12, with registration and an afternoon of preconference workshops. Ministry Expo will open at 2 p.m. Annual Conference sessions will start with laity and clergy sessions at 10 a.m. Thursday. To view the event agenda, click here. To download the workbook, click here. For those who wish to view the proceedings from afar, click here for the live webcast. On Twitter, use the hashtag #flac2013 to join the online conversation and follow live Annual Conference updates. The Gathering Area, an informal place to relax and learn about United Methodist ministries, will debut at this year's Annual Conference Ministry Expo. Graphic by Dave Walter. • Prayer Garden: Lake Hollingsworth B Room off Sikes Hall. - Ordination and licensing, 7 p.m. Friday: Youkey Theater.